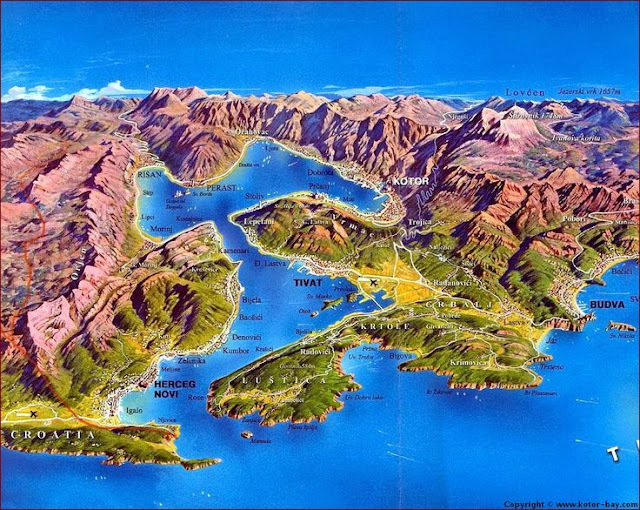 Rhizon (Ρίζων, Risinium) was an ancient settlement located near today's Risan in the Bay of Kotor, Montenegro. Originally an Illyrian settlement, it was later a Roman city. The earliest mention of Rhizon dates back to the 4th century BCE. Rhizon had been the main fortress in the Illyrian state where Queen Teuta took refuge during the Illyrian Wars. During the short reign of the Illyrian Queen Teuta, Rhizon became the capital of her empire. During theses periods a mint was established that issued several coinages: 1) autonomous coinages of the town, in bronze, 2) the royal coinage of king Ballaios , in silver and bronze, 3) most probably, the coinage labeled “Coinage from the Rhizonian Gulf”, which has been considered as the coinage of an alliance in which Rhizon played a part, in silver and bronze. The chronology of these coinages is still not defined with precision, primarily because the historical background of their issuance remains little known. Ballaios (Βαλλαιος; ruled c.167–c.135 BC) or (c.195–c.175 BC) was an Illyrian king of the Ardiaei. Ballaios was not mentioned by any ancient writers. Ballaios was a powerful and influential king testified by the abundance of his silver and bronze Greek coinage found along both coasts of the Adriatic. His silver issues are rare, but bronze coins (without the royal title) occur on Hvar, both in single finds and in hoards, and at Rhizon in a different series bearing the royal title. The coins of Ballaios were widely imitated in the region, sometimes so crudely that they are unintelligible. Ballaios reigned from his capital at Rhizon. a strong and well fortified city. The dating of his reign has been much disputed but he seems to have ruled after the defeat of Gentius in 168 BC, by the Romans. Ballaios is also known as Ballaeus. Ballaios minted coins in his own name in Greek. His coins with the long Greek legend ΒΑΣΙΛΕΩΣ ΒΑΛΛΑΙΟΥ (βασιλέως Βαλλαίου) were minted in Rhizon while the coins with the short Greek legend ΒΑΛΛΑΙΟΥ and the head of the king Ballaios which is of a different type and are older, were minted in Pharos. On the obverse of the coins a bust of the king facing left to right is depicted, while on the reverse greek goddess Artemis, advancing or standing, is represented with or without a torch, sometimes carrying one or two spears, surrounded by either the long or short legend. Most of these coins are bronze, some, and always those with the long legend are silver. Their weight, c. 3.5g corresponds top the Roman victorium. 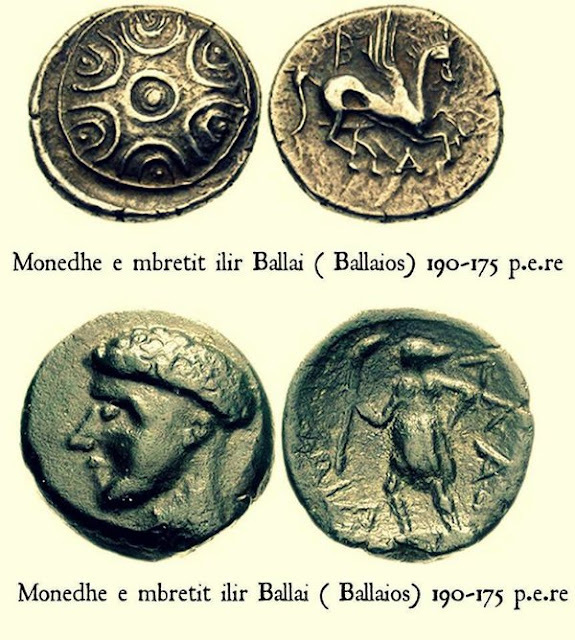 It is significant the Ballaios also had silver coins minted, which indicates his wealth and power, since elsewhere in Hellenistic Dalmatia silver coinage is very rarely documented from Greek/Illyrian mints. In several instances on some coins, an embossed circular Illyrian shield on one side and the flying horse Pegasus, a Greek mythological creature, and the letter "B", "A" and "L" on the other side, are depicted. Ballaios' coins were in circulation in the regions along both Adriatic coasts; along the eastern Adriatic, they have been found in a broad area extending from Phoenice in Epirus to Shkodër, in Albania, to Pharos, and along the western Adriatic from Leuca and Locri to Aquileia, indicating trade activity of Ballaios that was no longer controlled by Issa. As expected the coins of Ballaios were also found in the broad area of Narona, the most important Greek/Illyrian emporium which maintained along with the river Neretva, commercial and other contacts with the interior regions or Illyricum. In June 2010 at the site of the customs in Risan, 4600 coins of king Ballaios were discovered, placed in a bowl-like pot. Gorini supposed on the basis of a few silver coins that found in Rhizon which bear the long legend with the regal title, that Rhizon had been the capital of Ballaios' state. Artemis on those coins is depicted as advancing to the left, and is similar to the goddess depicted on Acarnanian dated to around 200 BC. Ballaios may have well began to mint his coins under the influence of the Acarnanian coinage. 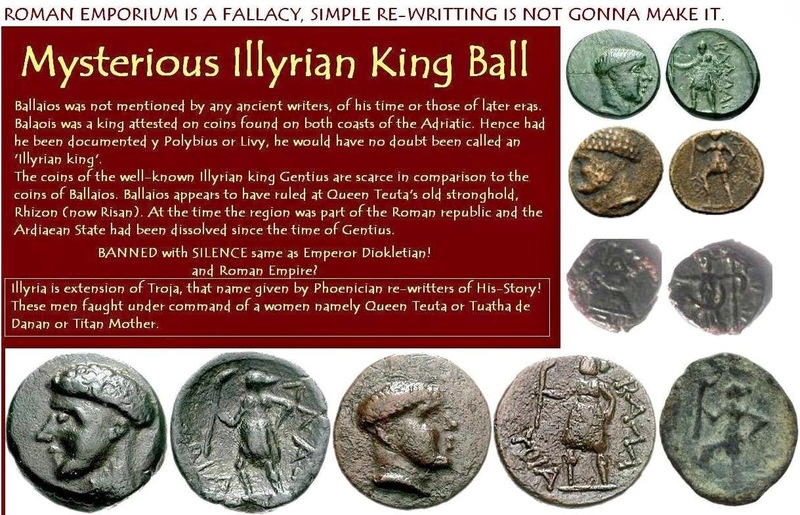 Political and economic relations between Illyrian monarchs and various Greek regions, as well as even marriage ties between Illyrian and Greek kings and queens were hardly exceptional. The finding of Ballaios coins along with other Illyrian and Greeks coins in Bari in southern Italy has made Gorini date the deposition of the hoard, which may have been a votive offering to c.125 BC, the context as a whole would the earlier chronology of the coins of Ballaios. Other sites where the coinage of Ballaios were found in an archaeological context is in the city of Daorson. There is hardly any mention in the literary sources of the town of Rhizon, and none of the king Ballaios. However, several features of these coinages such as the characteristics of style, elements of inscription and iconography (the presence of the Greek title “basileus ” on the coinage of Ballaios, and the presence of a Macedonian shield on the “Coinage from the Rhizonian Gulf”), metrology, choice of coined metals, etc. point to the 3rd and 2nd centuries BCE as the general chronological framework for the activity of the Rhizonian mint and for the successive issuance of the coinages of different issuing authorities there. Formerly the Bay of Kotor was known as Sinus Rhizonicus after the (Greek) name of Rhizon, the leading town in anticity of the bay. Rhizon had also its own protector, a deity called Medaurus (Μεδαυρος), who was depicted as carrying a lance and riding on horseback. The degree of Hellenization at Rhizon was very high. Hellenization or Hellenisation is the historical spread of ancient Greek culture and, to a lesser extent, language, over foreign peoples conquered by Greeks or brought into their sphere of influence, particularly during the Hellenistic period following the campaigns of Alexander the Great in the fourth century BC. The result of Hellenization was that elements of Greek origin combined in various forms and degrees with local elements; these Greek influences spread from the Mediterranean basin as far east as Pakistan. In modern times, Hellenization has been associated with the adoption of modern Greek culture and the ethnic and cultural homogenization of Greece. During the Hellenistic period, following the death of Alexander the Great, considerable numbers of Assyrians, Jews, Egyptians, Persians, Parthians, Armenians, and a number of other ethnic groups along the Balkans, Black Sea, South-Eastern Mediterranean, Anatolia, Middle East and Central Asia were Hellenized. The Bactrians, an Iranian ethnic group who lived in Bactria (northern Afghanistan), were Hellenized during the reign of the Greco-Bactrian Kingdom and soon after various tribes in northwestern regions of the Indian subcontinent (Pakistan) underwent Hellenization during the reign of the Indo-Greek Kingdom. 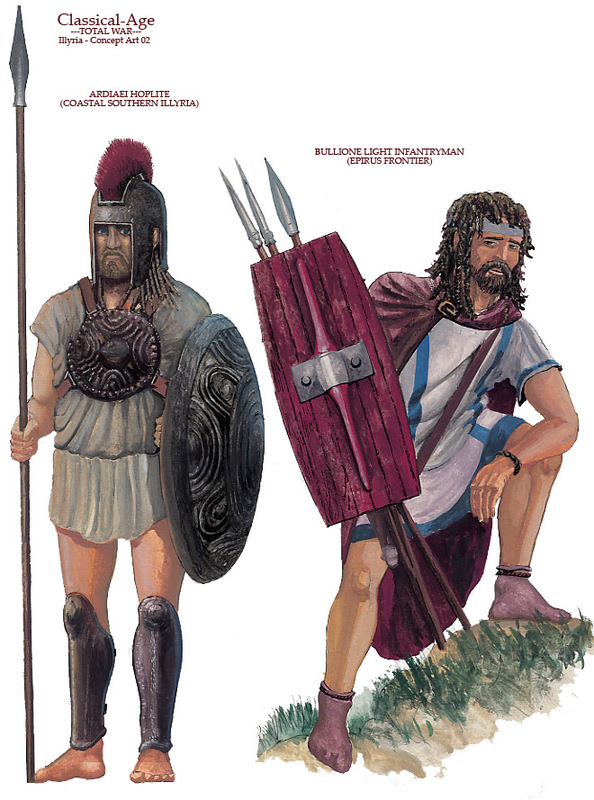 Other tribes that underwent varying degrees of Hellenization included Thracians, Dardanians, Paeonians and Illyrians south of the Jireček Line and even Getae. At this time, Greek cultural influence and power was at its peak in Europe, Africa and Asia, experiencing prosperity and progress in the arts, exploration, literature, theatre, architecture, music, mathematics, philosophy, and science. It is often considered a period of transition, sometimes even of decadence or degeneration, compared to the enlightenment of the Greek Classical era. The Hellenistic period saw the rise of New Comedy, Alexandrian poetry, the Septuagint and the philosophies of Stoicism and Epicureanism. Greek science was advanced by the works of the mathematician Euclid and the polymath Archimedes. The religious sphere expanded to include new gods such as the Greco-Egyptian Serapis, eastern deities such as Attis and Cybele and the Greek adoption of Buddhism. In Roman times, Rhizon or Rhizinium is documented as an oppidum civium Romanorum. Two Roman routes led through the Bay of Kotor. The most prosperous time for Roman Rhizinium came during the 1st and 2nd centuries, when huge villas were made in the area and the city had 10,000 inhabitants. Five mosaics are the most valuable remains of that period not only for Risan but also for Montenegro. The best preserved one shows Hypnos, the Greek deity of dreams. It is the only known image of this kind in the Balkans. The famous English archeologist Sir Arthur Evans led those initial excavations in 1885. The invasions of the Avars and Slavs left the city deserted. The last reference of a bishop in Risan dates back to 595. Risan is a town in the Bay of Kotor, Montenegro. It traces its origins to the ancient settlement of Rhizon, the oldest settlement in the Bay of Kotor. Lying in the innermost portion of the bay, the settlement was protected from the interior by inaccessible limestone cliffs of the Orjen mountain, the highest range of eastern Adriatic, and through several following narrow straits in the Bay of Kotor from the open sea. While the Krivošije karst plateau that hangs steep above the narrow shores of Risan bay receives over 5000 mm rain annually (European record), several strong karst springs that form a short brook collect in the narrow cultivable belt at Risan. The earliest mention of Rhizon dates back to the 4th century BCE, as the main fortress in the Illyrian state where Queen Teuta took refuge during the Illyrian Wars. The degree of Hellenization at Rhizon was very high. In Roman times, Rhizinium is documented as an oppidum civium Romanorum, and the most prosperous time for Roman Rhizinium came during the 1st and 2nd centuries, when huge villas were made in the area and the city had 10,000 inhabitants. Five mosaics are the most valuable remains of that period - not only for Risan but also for Montenegro. Circa 500 it became the see of the Roman Catholic Diocese of Risano. The invasions of the Avars and Slavs left the city deserted. The last reference of a Roman bishop in Risan dates back to 595. In the 10th century, the Byzantine emperor Constantine Porphyrogenitus includes Risan among the inhabited towns of Travunia, while the priest of Doclea considers Rissena to be a district. During the Middle Ages, Risan lost the significance it used to have in the ancient times. No later then the 13th century, the Italians provided the bulk of a henceforward unbroken series of Latin Catholic Bishops of Risano until its suppression circa 1630. In the mid-15th century, Risan was referred to as a town of Herceg Stjepan. In 1466, the Venetians offered to give Brač island and a palace in Split to Herceg Stjepan, in exchange for his two towns (Risan and Novi) in the Boka Kotorska. In 1482, the Turks took Risan, together with Herceg Novi, from Herceg Stjepan's son Vlatko, using it as a base for its corsairs to pirate Venetian shipping sailing from their nearby holdings of Cattaro and Perasto. Only in 1688 Risan became Venetian as part of the Albania Veneta with the Venetian name of Risano, enjoying a temporary economic growth. In the following centuries Risan has had the same fate as the whole of Dalmatia. It was for a few years during World War II part of the Kingdom of Italy in the Italian Governatorate of Dalmatia and actually it is part of the newly independent Montenegro. According to the 1627 population census, Risan had 800 citizens. 570 were Muslims, 150 Orthodox and 80 Catholic. In the present-day Risan, there are no elements that could connect it to the medieval town. Risan by the sea was probably just a settlement. However, on the Gradina hill, above the famous archeological site of Carine, a fortification is situated containing remains of an Illyrian acropolis, as well as the medieval and Turkish stratum. The position of the fortification was excellent, particularly for the control of Risan Onogošt route, while the hilltop itself was inaccessible. Today Risan is a small port with roughly 2000 inhabitants (in 1900: around 5000 inhabitants; of them 80% Orthodox Christians , 20% Catholics) where logs from the vast virgin forests of the Bijela gora are shipped mostly to Italy. Risan is a tourist destination that has a hotel called after its most famous citizen, Queen Teuta, with accompanying fine beaches. Risan is in the northern section of the Municipality of Kotor. Αναρτήθηκε από ΕΛΛΗΝΙΚΗ ΙΣΤΟΡΙΑ ΚΑΙ ΠΡΟΙΣΤΟΡΙΑ - GREEK HISTORY στις 4/07/2017 12:27:00 μ.μ.